The shadowy warrior is one to fear, as much for their prowess as for their appearance. In this suit of Dark Armor, intimidating will barely describe your look. With its impressive design, this armor will leave your foes in awe. This armor is perfect for any warrior to wear when taking to the field! The armor consists of a cuirass that is made up of three distinct bands that wrap horizontally around the torso, providing successive layers of protection, while segments of stylishly cut leather have been riveted to the surface to give it dark, gothic detailing. Included with the cuirass are a pair of pauldrons that flare out and up from the shoulder, creating a distinctive silhouette when worn. The pauldrons are riveted leather designs that echo the look of the cuirass, while also featuring a chain link connection in both the front and the back that suspends an ornate medallion in the front. The whole effect creates a warrior who looks gothic and dark, yet impressive and regal. The pauldrons feature ties that secure them to the shoulder straps of the armor, although a mobile warrior can chose to go into battle without them if he or she so chooses. The armor is available in two colors, either brown or black, both of which look fantastic. Thanks to the belted fasteners with buckles and grommets, the armor features a great deal of adjustability to suit personal preference and comfort. That being said, order your armor in the size closest to your own for the best fit. 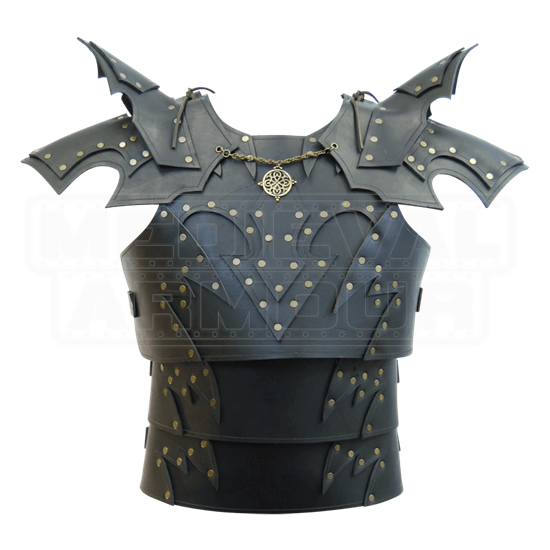 Fit for a hero or a villain, a paladin or a blackguard, this Dark Armor assures you of two things. 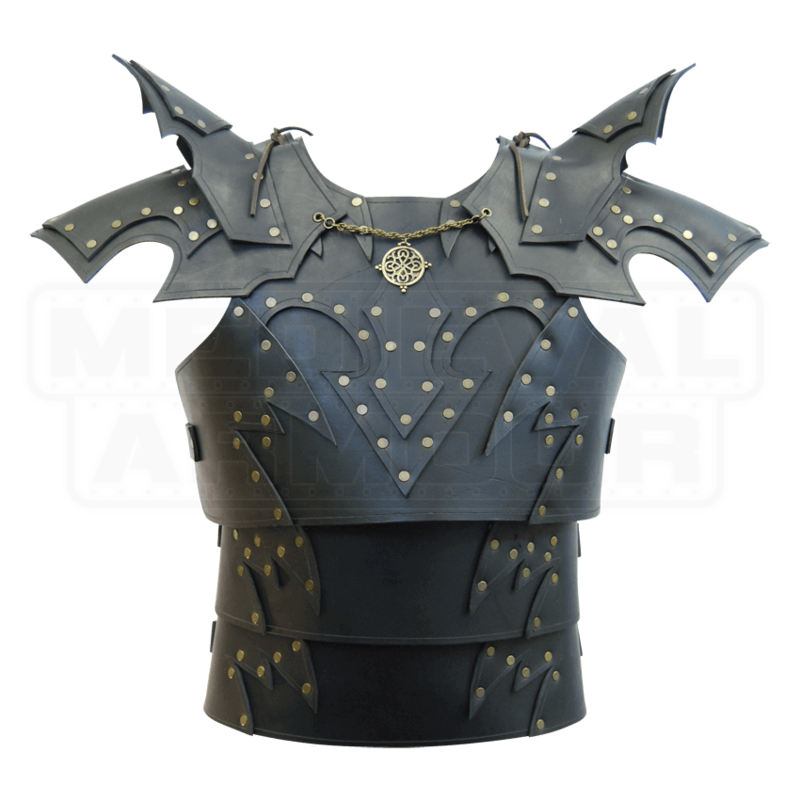 The first is that you will be well-protected by quality leather armor, and the second is that you will look incredible, whether you are marching into a LARP battle, standing on a stage, or showing up at a fair or costume event. I purchased this piece in 2013 and I love it. I wear it every year to faires and I always get compliments on it. I try to make 1-2 purchases every year to add to my outfit, whether at the actual faires or from here, and this piece (while expensive) was perfect and has been very easy to accessorize for.